The WATER WASH SPRAY BOOTH provides an extremely efficient means of removing paint particles from the exhausted air by using water as a filtration media; we have designed the WATER WASH SPRAY BOOTH for many finishing applications. We also offer both pump as well as no-pump versions in open type model, enclosed type model and conveyorised models. Standard WATER WASH SPRAY PAINTING BOOTHS are utilized for high volume paint usage, medium or large sized components and batch processes. >Water Screen Type Water Wash Booth contains special features like water tank or over spray paint collection disposal tank, specially designed eliminators (baffles), saw tooth plates, washing chamber and high pressure exhaust blower. 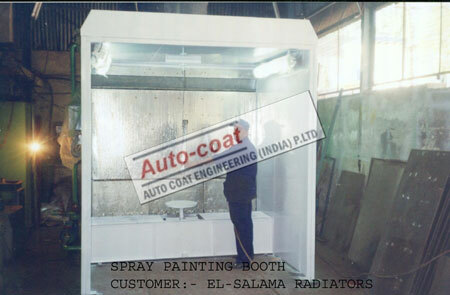 This type of painting booth is more popular where the paint consumption is 10-100 liters/shift , heavy paint consumption, high production and / for any component. 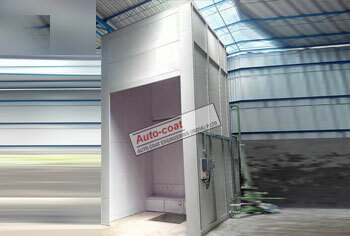 Working of WATER WASH SPRAY PAINT BOOTH is Autocoat Specialty Designed. When the paint is sprayed on the component the over spray is sucked rapidly by the high pressure centrifugal blower through the saw tooth plate and the eliminator. By generating high tornado action paint waste particles get cut at the saw tooth plate thereby separating the thinner to the exhaust blower and paint waste into the tank. Finer spray Sludge or paint sludge dust is eliminated in the washing chamber. Paint is actually washed in this chamber. The best advantage of WATER WASH SPRAY BOOTH is that lumps of waste paint are collected in the collection tank thereby helping the user to dispose it easily. Maintenance in this kind of Water Wash Spray Booth system booth is very low as compared to the Dry Back versions. 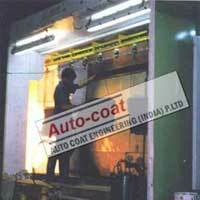 The WATER WASH SPRAY BOOTHS designed and engineered by Autocoat, is available in three kinds of schemes, namely. Standard Water Screen Type Water Wash Booth also known as No-Pump Booth or Pumpless Booth. 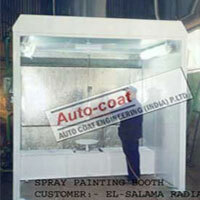 WATER WASH SPRAY BOOTH DESIGN with water curtain or water screen. Civil Excavated Water wash paint booth. For high volume paint consumption (more than 100 ltr/shift) Autocoat has developed Auto Paint Sludge Removers, (import substitution) to be used along with Paint Sludge Pit or Paint Sludge Sedimentation Plant. Such Auto Piant Remover will have to be incorporated in new painting plant or in existing painting plant with the modification in civil work & pumping system. System helps to remove online paint sludge removal so that efficiency of painting plant is maintained. The Water wash paint booth provides an extremely efficient means of removing paint particles from the exhausted air by using water as a filtration media, have designed the Water wash paint booth for many finishing applications. 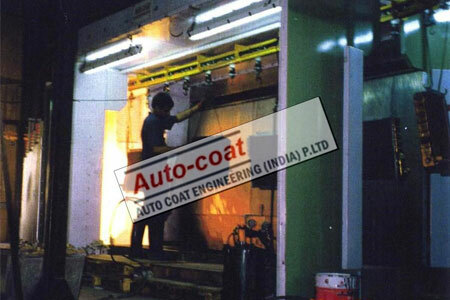 In Autocoat Water wash spray booth, Air from washing chamber containing pain spray particles enters between the entertainment plate and the water surface at high speed. It is then subjected to two rapid changes direction. These throw the solid paint particles into the water stream with great force. They are then carried into the base of Washing Chamber with the water for the return to the water tank. Air is exhausted via eliminator plates which remove any entrained water. 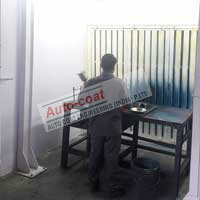 Autocoat Water Curtain Booth is designed with Water curtain with pump for dust free paint shop or for plastic painting. Lab Water Booth is selected suitable for if application of different types of paints. Same way for large Painting Plant Conveyorised Water Wash Booth with paint sludge removal system is more popular.